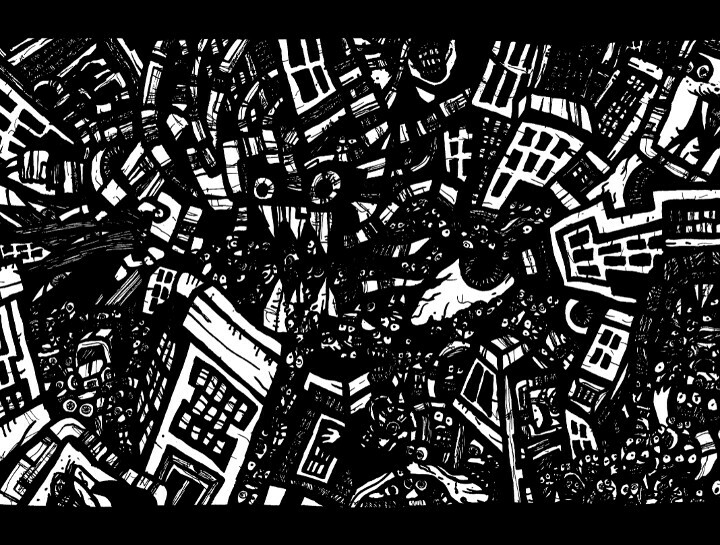 ART DOODLE "THE CITY OF GEARS"
Art Doodle City of Chaos! The City is like a giant gear, all the buildings, wires and roadways make up the machinery but it is up to all the people moving through it to power the factory. Each and every person and thing play an important role in the chaotic ballet of our daily routines. The giant Robotic billboards spout messages while the crowds move back and forth commuting and consuming at an immeasurable pace. In the middle of the madness lies the eye of the city, an enormous metaphysical manifestation of the collective unconscious. The omnipotent ocular is made up of all things human, our thoughts, goals, dreams and desires. As the city spins centrifugally around the eye constant battles between man and machine, good and evil, the body and the soul rage on. 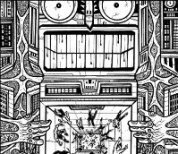 As the giant mechanical monstrosities run rampant through the streets using extraterrestrial technologies to manipulate the metropolis the lines between opposing forces become increasingly obscured. On one side an electronic device corrupts the mind of a young denizen while mere moments away the same piece of equipment is used to save someone's life. In the end one can only conclude that all of these things are necessary. It is all the different people, stories, incidents and accidents that breath life into the city. If any one side were to triumph the entire system would fall as the metropolis feeds on constant struggles in order to survive. Superheroes and super villains collide in the skies as mutated and mixed messages infect the airwaves. The big picture appears to be that of an indecipherable madness yet in each tiny corner we can find some beauty in existence. 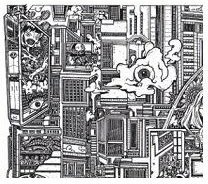 The “City of Gears” is a series of detailed pen and ink drawings regarding an imaginary symbolic metropolis. The works examine various conceptual perceptions about urban lifestyles focusing on comparisons between the notion of “the big city” as a collective entity and the role of the individual in a major metropolitan center. In this particular image I used a chaotic amalgamation of buildings, traffic jams, robotic and people to create a personification of the city. The overall image is jam packed with random energy as all the aspects of the city spin and mix together around the city's giant eye. 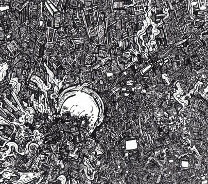 While the overall effect represents an amalgamated chaos all sorts of smaller unique adventures can be discovered in any portion of the drawing.